Kraft Fluid Systems is the leading industrial distributor of hydraulic equipment and provider of mobile drive solutions in the Midwest US. The company sells, services and inventories world-class mobile hydraulic equipment. With more than 45 years of experience, Kraft is the preferred distributor when seeking hydraulic components, power transmission equipment and electronic controls for mobile OEM integrated solutions. The employee-owners at Kraft take ownership of every client challenge and have the technical expertise and knowledge to provide the best custom solutions based on decades of hands-on experience and training like no other in the industry. Clients know Kraft Fluid Systems for its expertise, integrity, passion, and a relentless focus on providing increased value and helping customers sell more equipment. All employees of Kraft Fluid Systems are owners of the company. Kraft employee-owners are passionate about their work, their clients and providing the best solutions for hydraulic equipment needs. No other hydraulic distributor has the depth of knowledge, experience and technical expertise designing and engineering mobile OEM applications. The employee-owners at Kraft are extensively trained in hydraulic systems, many of which are certified hydraulic professionals. The average length of service for a Kraft employee-owner is 15 years and many have decades of hands-on experience in engineering, field sales and technical service. Working as a team, Kraft helps its clients sell more equipment by designing and engineering custom drive solutions that offer the best performance, reliability and value. No other distributor invests in its employee-owners more than Kraft in training, education and certifications. Recognized and supported by world-class manufacturers, Kraft provides extensive inventory support and complete service for mobile hydraulic integrated solutions. 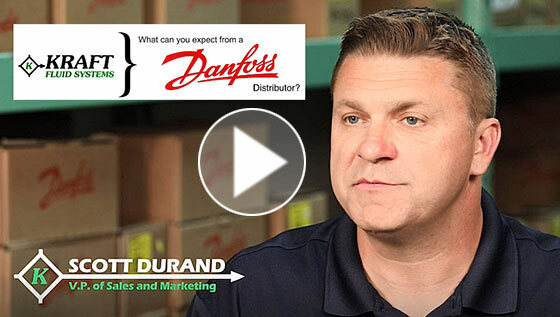 Click the image to launch our YouTube channel and play the Danfoss video. A new window will open.